Motorcentral DMS allows you to modify independently the fonts used when displaying lists (eg. your Vehicle Inbox list), as well as the remainder of the software application (ie menus, dialog boxes etc). 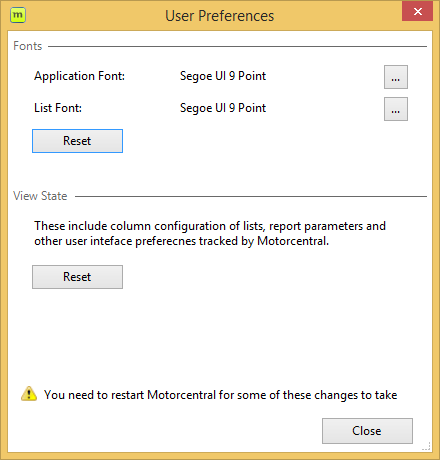 Both the font family and font size used within the Motorcentral DMS User Interface (UI) can be modified. This may come in handy if you are finding it difficult to read the standard system font Motorcentral is initially shipped with. From the main window menu bar select File > User Preferences. Select the ellipsis (...) button next to Application Font and choose your desired font settings. Based on your choice the List Font will also change to the same settings selected. If you wish to have different settings for the list views click the ellipsis (...) button next to List Font and choose your desired font settings. Click the Reset button located under the Font section of the User Preferences window. Click Yes to confirm you wish to reset. PLEASE NOTE: Some font changes will need you to log out and log back into Motorcentral. If your desired font changes are not visible please log out and log back in accordingly.